The crowd at Ford Fest 2012. If you read Torontoist, chances are that you don’t agree with the mayor’s politics or his personal conduct, but that doesn’t necessarily mean you can’t go to his party. The whole city is invited, and that includes you. 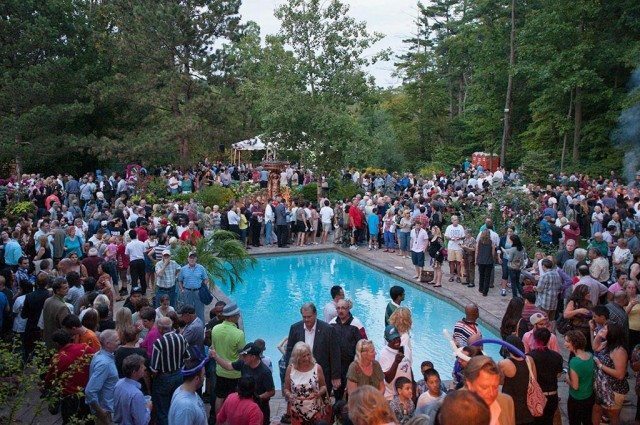 Here’s how to make the most of your night out at Ford Nation’s moveable feast—assuming it isn’t completely rained out. Ford Fest has historically been held in Etobicoke, in Ford’s mother’s backyard. This year, probably in recognition of the fact that running a political event as though it were a prom afterparty isn’t the best outreach strategy, the mayor is taking his show on the road. Tonight’s event takes place in Thomson Memorial Park, in Scarborough. It starts at 6 p.m.
There’s no point in arriving late to Ford Fest. If you show up early, you’re not going to end up alone with the mayor, struggling to make awkward small talk. In fact, you’re unlikely to interact with him at all, beyond a possible handshake on your way in. In past years, he’s made himself scarce for the bulk of the event. His brother, Doug Ford, is more of a mingler, but he’ll be mobbed by photo-seeking supporters throughout the night. You might as well arrive as close to 6 p.m. as possible. The Fords are expecting a crowd of thousands, so a timely arrival will ensure that you get a good parking spot. Going early will also allow you to catch speeches and photo-ops. At previous Ford Fests there have been some politicians (other than the Ford brothers) in attendance, but that was before the crack scandal. It should be interesting to see who takes the stage this year. There will almost certainly be someone at the gate collecting names and email addresses. There’s no real reason to give fake information—the worst-case scenario is that your email gets added to Ford’s campaign mailing list—but you can make up a false name if you want. There are free hamburgers at Ford Fest, but they’re not to be relied upon. Last year, the line for food was about 90 minutes long. Hungry guests were grabbing as many burgers as they could hold in their hands. It was like watching footage of refugees at a Red Cross tent after a tsunami, except everyone was dressed for leisure. You don’t need the mayor’s meat. Have a sandwich beforehand. It’s hard to generalize the people who show up to Ford Fest. The crowd in past years definitely hasn’t been as white or as geriatric as might be expected. Some attendees were clearly there for the free food and not the politics. It’s possible to get mildly buzzed on free beer and wine, and as long as you’re respectful, nobody will mistreat you or question your right to be there. There will probably be a handful of odd personalities in attendance, but that’s true of any event related to city politics. On the other hand, you may find a contingent of curious outsiders like yourself.